The Smithsonian Institution's National Zoo just disclosed that surgery was performed late last year on a horse to reverse a vasectomy originally performed in 1999. This was the first reverse vasectomy ever performed on a horse. It was not just any horse: it was the National Zoo's endangered Przewalski horse, one of a few hundred wild horses alive today. 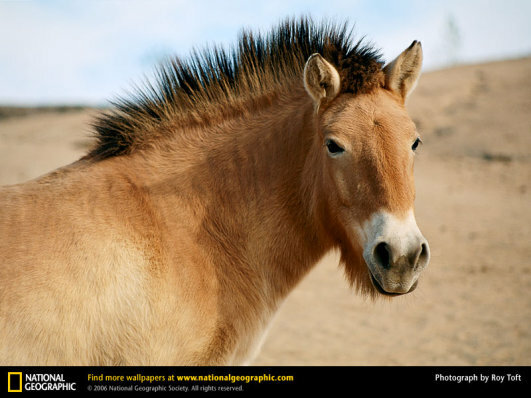 The Przewalski horses are the only surviving truly wild horses left in the world, and most of the remaining members of the subspecies are in captivity. The Przewalskis originated in Mongolia and were named for the man who discovered them in 1879, Russian explorer General Nikolai Michailovitch Przewalski... but evidence of the Przewalski's ancestors dates back to 20,000 years ago. The horses became extinct in Mongolia in the 1960's, due to inter-breeding of the subspecies with domestic Mongolian horses, hunting of the Przewalskis, and the competition for water with other species that moved into the Mongolian highlands. In the late 1990's, Przewalskis born in European zoos were re-introduced to restricted areas of Mongolia so they could eventually re-populate in their homeland. Still, there are only a few hundred of them in Mongolia; the rest are in captivity. "Minnesota," the National Zoo's Przewalski, is a former resident of the Minnesota Zoo. Researchers recently learned of Minnesota's pedigree, that his genes were very true to his subspecies, and veterinary surgeons performed the reverse vasectomy in the hopes that Minnesota would mate and produce "true" offspring. Hopefully, Minnesota will be alive and interested in mating when the Zoo's staff locates a suitable mare. The average life span of a Przewalski in captivity is only 20 years; Minnesota is 20 years old. "A vasectomy might be performed on an endangered animal because of space constraints, the size of species or if an animal has already produced many offspring and its genes are overrepresented in the population, said Budhan Pukazhenthi, DVM, PhD, a reproductive scientist at the National Zoo's Conservation and Research Center in Front Royal, Va."